SportPromotion Diplomat Cup 2013, indoor football tournmanet will take place 3rd time and has charity purposes. This year the support destination is SA Haapsalu Hoolekendekeskus. 12 teams will be invited to the tournament: Russian Federation, Ukraine, Italy, UK, France, Spain, Denmark, Turkey, Georgia, Armenia, Latvia and Estonia (Riigikogu). Main rules: open court with no boards, five-a-side teams (goalkeeper and four players), match time 12 minutes (TBC), substitutions during the breaks, free kick instead the throw in if the ball goes out, two minutes penalty in case of yellow card, no offside, no tackling. The winners of the tournament will be awarded with trophies and prizes. In addition, the penalty shoot-out competition for female embassy representatives will be organized during the tournament. The official reception for the official representatives of the embassies will be held on April 21 at 20:30 at Meriton Grand Conference & Spa Hotel. The tournament fee is 100 EUR for a team. The benefit on gate receipts will be donated to the support of SA Haapsalu Hoolekandekeskus. The tournament will be organized in co-operation with BC Kalev/Clamo. 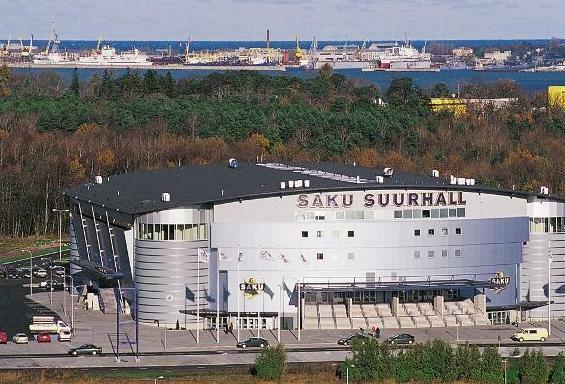 Saku Suurhall Arena is the largest arena in Estonia. It was built in 2001 and holds up to 10,000 people. It is named after the Estonian beer Saku. It generally hosts basketball games, as well as ice hockey and concerts.